Posted On May 12, 2016 by &filed under Legal Articles. Reservation policy was made to uplift the weaker and poor section of community upwards and to give the equal status to these people at par to other rich and high society communities. With the passage of time and upon demand of other communities, more castes were added time to time under this policy to give them benefit. But this policy becomes a serious threat to the nation now. Meritorious students/candidates are losing jobs and opportunities due to this policy. Political pundits are the main culprits of this policy. They do not want the welfare of the people but they work only for their vote bank. In India, majority remains with illiterate and poor people. The Political leaders misguide them on this issue. They offer reservation to them in every sector, whether it is job recruitment or job promotion. They stands upfront from the other meritorious students of general category under this policy. Moreover, a reserved category candidate can enter in the shoe of general category also but not vice versa. 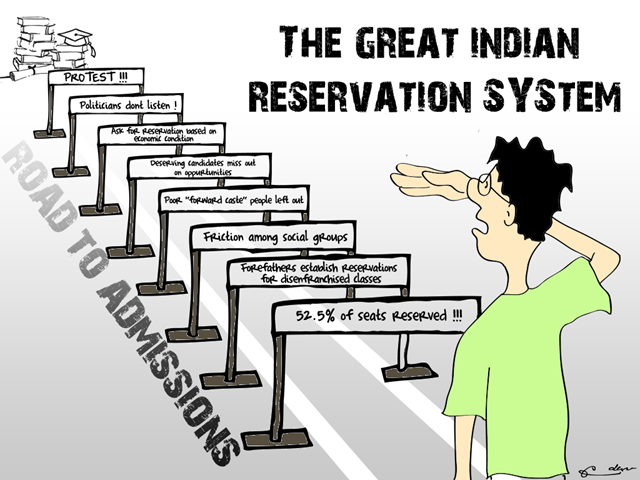 I am not against the reservation policy. But I want some amendments in this policy. It is undoubtedly right that when this policy was frame, the country was really in need of this policy. There was a very big discrimination between the upper and lower castes, which compels to the people for the agitations and which results in to this policy. The main purpose of this policy was to diminish the gap between the upper and lower castes. That was the demand of that time. But now, meritorious candidates are getting affected in a big way now. Some times a general category candidate works for his/her whole life as a class 4/5 employee, but in the same conditions the other candidate of reserved category got promotions and promotions and sit at the top position of the departments. This is not fare. This policy is mentally torturing to the general candidates. But they can not do anything. Let me tell, if we place a candidate with 33% or 40% marks in medical college instead of 75% of general category candidate, they how can we expect that he will treat the patient in efficient manner. If we place a reserved category candidate with lower marks like as above instead of meritorious student in a engineering college, then how can we expect a better development in our infrastructure or how can we expect that our Nation will stand at par with other developed nations. More worse than this, our meritorious candidates are not well paid in country. They are compelled to go outside of Indian origin for the higher salaries and they have no other option to leave their homes and their families. Even these candidates are sit at top CEO positions in U.S. or in other countries, and think if they were given proper opportunity in India, they can shine our country. Meritorious candidates are lying vacant in the lines of unemployed youths or compelled to do the job on lower salaries. On the same time, unparalleled candidates with the stamp of reservation stands in upfront positions. I strongly support my issue that only one family member should be given the benefit of this policy and this benefit would be given for one time only. I wonder when a candidate is uplift by this policy, then why he/ she needs the benefit of the reservation in future at every step of his/her life. We have made them dependent for the whole life. They have forget to live with out the help of stick of reservation. Once a candidate uplifted, he or she stands on the equal footage of upper category castes. And after that he or she should be promoted only if he/ she deserves. This is not a way to promote the nation. If we want to promote the nation on the right path, We need efficient candidates not reserved candidates. I again tell here that I am not against the policy of reservation, but I advocacy for the amendments in the policy, which is the demand of time. We should build the nation with efficient candidates and proper salaries should be given to them so that, they can earn necessaries and luxuries according to their family living standard and they did not think to leave the country for the better opportunities in abroad. I am sure this will be the right step towards the improvement of environment of govt. offices also. Because right man will be placed at right position and they will work in right direction. If we expect the political leaders will move for this amendment, they will never do this. Because they divide the people on the issue of caste and religion and rule over them. This is the main reason that why they are not real well wishers of the country. Rest of this, I acknowledge here that these are my personal views seeking the better growth of the nation and my purpose is not to hurt any one feelings. My purpose is also not to degrade any community. I think that each and every people who take birth in this world is a son of God. There should be no discrimination on this chapter. Modi Ji is requesting to every people to leave their subsidy, I suggest them that he and their party workers should request to the people to leave the benefit of reservation. This will be the right step and this will start from our self only. Do not expect the political help on this chapter. 1. Son or Daughter of a person, who have already take reservation benefit and sit at the gazetted post really needs reservation or not. 2. Where would economically backward people of general category goes. They can neither get reservation benefit nor any type of financial help. 3. Is giving priority to sc/bc student who have got 35% or 40% marks instead of meritorious student from general category who got 75% above marks right or wrong? Are we building a better nation by placing these unqualified persons on the top posts? Is is justified for the general category students? Can A Doctor saves a serious patient, A Engineer make a better infrastructure, A Judge give justice to the innocent person if all these are employed through the channel of reservation mode? Are they equally efficient to give services comparable to meritorious students? This is a serious matter of concern and it should be discussed on the level of advisory committees. I know, it is very difficult to amend this policy, because political pundits are the main culprits and they do not want to close their vote bank. Even they did not want to educate the general people, because if the common man get educated, they will not caught in their false promises and they will demand transparency in the official working system. Political parties are highly corrupted and Indian common man is not so educated. Mainly people belongs to villages. They concern to earning bread only. They did not bother for big scams and these political parties are taking benefit from these peoples. They makes big promises for the vote in election, and after elections they did not come to their constituency. Right to Information Act, 2005 brings some awareness in the public, but these parties are not ready to give information under preview of this act. Can they tell to the general public at the time of election, what is the problem of political parties to object the RTI act for the political parties. They really did not want to work in transparent manner. While making the Constitution, the position of Dalits, backward classes was really very bad. But this policy was made for the period of tens years only. After the passing of 68 years of Independence of India, I think We have came almost in our third generation. Backward class came in front or not, but the situation of economically backward is still bursting. It’s need of time to re think the policy. I make an appeal to every reader of this article, support this voice and forward this message to more and more, so that it becomes voice of India. This is difficult but not impossible. Freedom was also difficult, but we got it after very hard struggle. Now the time again demands for the struggle. So, prepare yourself for this fight against political leaders and criticizers. Make open debates, discussions, take reviews from the panels, join some expert groups and let make this as a national issue of debate. This will surely help in removing this cancer from the Indian Constitution.
. Son or Daughter of a person, who have already take reservation benefit and sit at the gazetted post really needs reservation or not.Serious This will surely help in removing this cancer from the Indian Constitution. 102 queries in 0.211 seconds.